Media reports from around the country have drawn attention to the critical shortages of vital medicines in hospitals, health centres and aid posts. These shortages are causing unnecessary suffering and even death – especially among the most vulnerable; young children, pregnant mothers, the elderly and disabled. All of which could be prevented. PNGi has discovered that the government has to hand a detailed report setting out solutions that would tackle critical failings observed within the National Department of Health (NDoH) and its private contractors; yet is failing to implement the recommended reforms. The report, dated 6 November 2017, which is sitting on the Health Minister’s desk, is from a wide ranging ‘special’ audit, ordered by the Prime Minister, coordinated by the Chief Secretary and conducted by the Internal Audit Branch of the Prime Minister’s Department. The, auditors damning findings, reveal widespread failures throughout the medical supply and distribution chain which, they claim, have persisted and not been addressed over several years. The report contains details on a specific instance of alleged high-level corruption, widespread opportunities for fraud, overpayments to contractors totalling as much as K80 million a year, and delays in orders and distribution which can last not just months but years. It also reveals widespread violation of proper management and accounting principles within the NDoH and a complete failure to monitor the performance of companies on multi-million kina contracts. 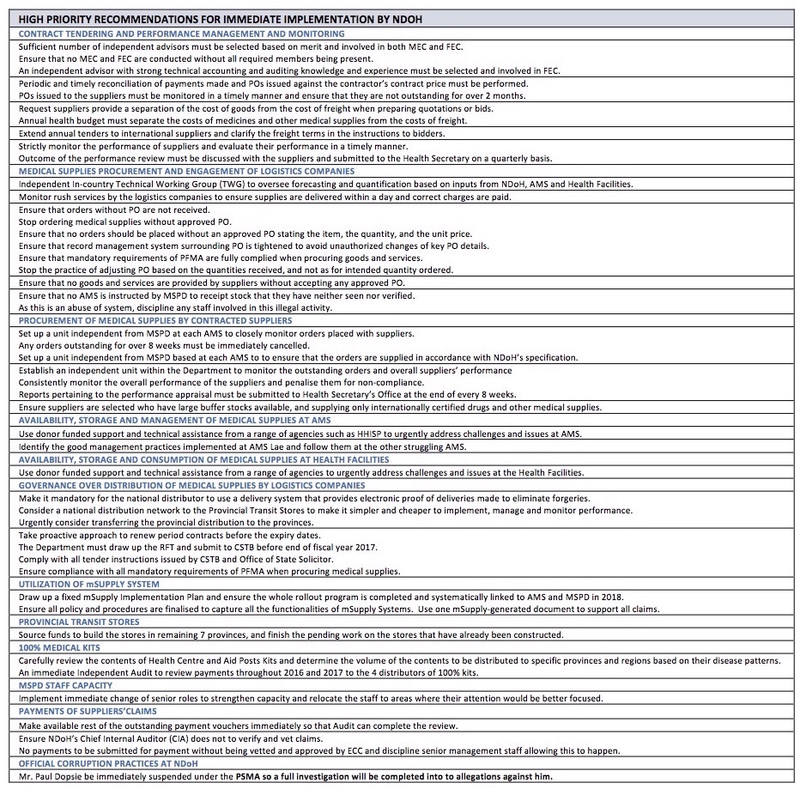 The audit report recommends a number of immediate, short-term and long-term reforms to deal with the most critical failures, including the outsourcing of the procurement function away from NDoH in order to address the ‘urgent need to have an effective and efficient procurement and distribution of medical supply system’ [p3]. Three months later its recommendations have not been acted on. Specifically, it appears the Minister for Health has failed to make a submission to the National Executive Council seeking endorsement of the reform package, this is despite a draft submission having being written for him by the Prime Minister’s Department. The Minister and his Health Secretary, Pascoe Kase, have also, allegedly, failed to take any steps to implement any of the most urgently needed reforms, including disciplinary action and reassignment of staff identified as failing in their roles. Below we reveal the audit findings and key recommendation in the hope that public exposure might force action. The National Department of Health is responsible for the procurement, supply and distribution of pharmaceutical drugs and other medical supplies to all public hospitals, health centres and aid posts. Such supplies are grouped into two types, General Hospital Orders and Medical Kits. 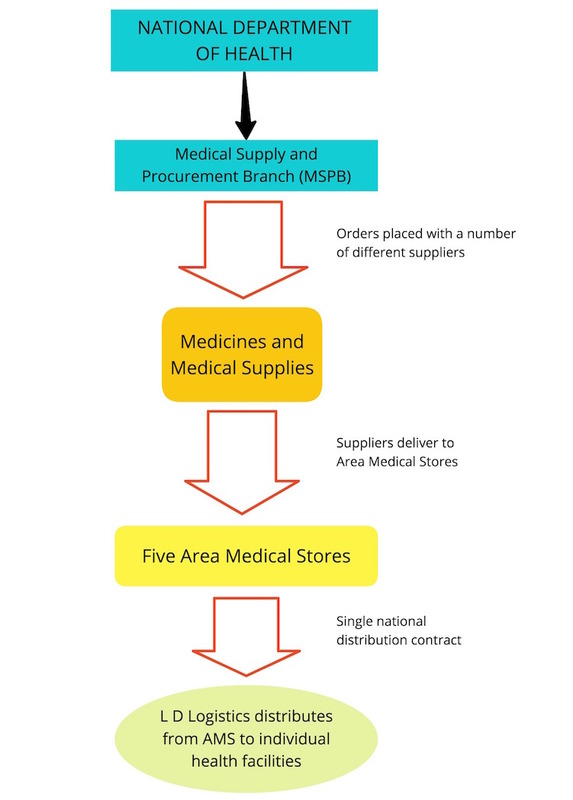 For the general hospital orders a number of contracted suppliers deliver the medical products to one of five Area Medical Stores [AMS] located in Badili (Port Moresby), Wewak, Lae, Mt. Hagen and Kokopo. At the AMS the products are re-packed and sent to specific hospitals, health centres and aid posts . LD Logistics Ltd is the sole national distributor contracted to collect the packaged orders from the 5 AMS and delivers them to the health facilities. The Medical Kits are intended only for Health Centres and Aid Posts. They are sourced from a single supplier, Borneo Pacific Pharmaceuticals Limited, a controversial firm featured in previous PNGi reporting. Borneo is responsible for delivering the kits to seven different seaports around the country. There are then four regional logistics companies contracted to pick up the kits from the ports and distribute them to medical facilities. 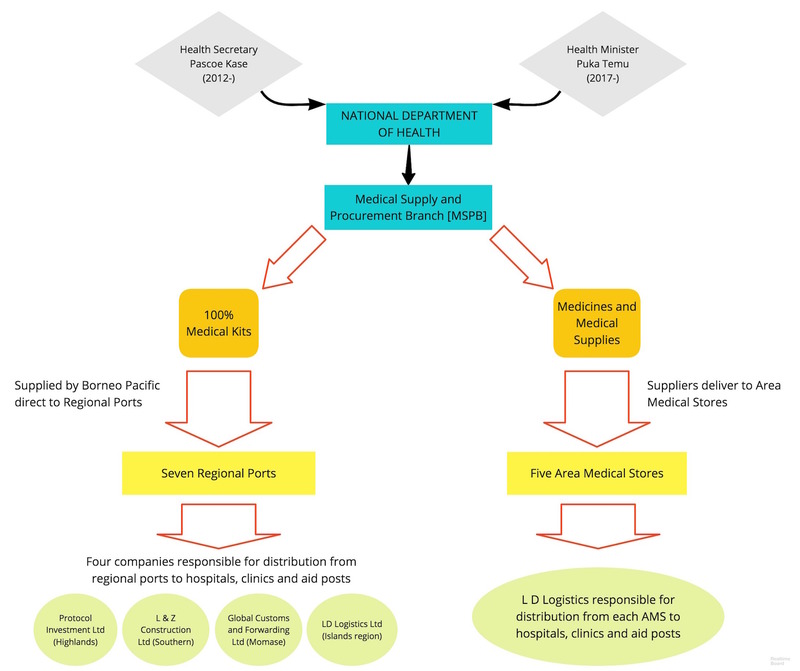 Within the NDOH, the Medical Supplies Procurement and Distribution Branch (MSPD) manages all the procurement and distribution of medical supplies. The audit report reveals a frankly pathetic level of contract management and monitoring within the Health Department. The audit also found that there is no management of outstanding purchase orders to chase suppliers to deliver the ordered products. At the time of the audit, the auditors found there were K184 million worth of orders pending supply and delivery to the AMS. Over 45% of those order had ‘been outstanding for more than 6 to 12 months’. [p11] No penalties or price reductions are applied for late deliveries. The audit also raises the suspicion suppliers are overcharging for delivery to some ports. This is because although it costs almost twice as much to ship goods from overseas to ports like Mt Hagen, Kokopo or Wewak as compared to Badili and Lae, suppliers charge the NDOH the same prices for delivery to any of those places. The audit says that in October 2016 a study by USAID urgently recommended NDOH insist suppliers separately account for their freight costs but this has never been implemented. The audit estimates the overpricing could have cost the government and taxpayers as much as K80 million in 2016 alone. The procurement and distribution of pharmaceutical drugs and other medical supplies is the responsibility of the the MSPD. The MSPD is directly responsible for requesting quotes from at least three suppliers for contracts under K500,000 in value. Contracts over K500,000 are supposed to be referred to the Central Supply and Tenders Board to publicly tender. The audit reviewed all purchase orders raised in the period January 2016 to August 2017 and found the NDOH is failing to plan ahead and buy in bulk so it can maximize its savings. Only 14 out of 10,249 of the reviewed orders were for amounts over K500,000. This also indicates the MSPD could be deliberately keeping individual orders below the threshold where there would have to be a public advertised tender. 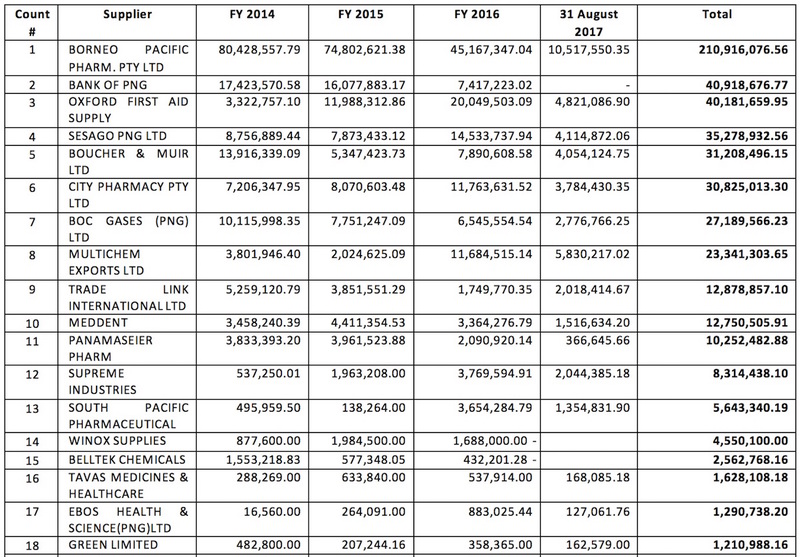 In the specific case of Borneo Pacific, the audit found ‘approximately K10 million worth of medical supplies were delivered during the middle of 2017 with[out] receiving any approved POs’. In another ‘serious breach of GoPNG’s procurement policy as stipulated in the PFMA’ the audit found ‘AMS are normally requested by MSPD to prepare receiving report for stocks they have neither received nor verified’. The audit report provides details of three specific instances of this practice, all relating to goods allegedly supplied by Borneo Pacific. The audit attempted but failed to conduct an audit of the payment of suppliers claims by the NDOH. The auditors randomly selected 148 payment samples from the payments made to the logistics companies, and 110 payment samples from payments made to the suppliers. However, when they requested the payment documentation from FMS they received only 25% of the requested payment vouchers. The appalling lack of pharmaceutical drugs and medical supplies at hospitals, health centres and aid posts is not just the result of how the NDOH manages its central drug procurement and distribution contracts. The NDOH’s failures, according to the audit report, also extend to its management of the Area Medical Stores. These challenges include minimal staffing, high absenteeism, no overtime pay, poor staff education, and poor stock record keeping at the Area Medical Stores level. Area Medical Stores receiving drugs that are near-to-expiry, and having no capacity to test the medicines supplied. The audit records a number of issues reported by the Area Medical Stores in relation to the national distribution company LD Logistics Ltd.
LD, it will be recalled, is the company engaged by NDOH to distribute medicines and medical supplies from the five Area Medical Stores to hospitals, health centres and aid posts. LD Logistics Ltd does not have full capacity to carry out deliveries to all health facilities throughout Highlands Region. In total, the audit found, LD Logistics was paid K84,234,130 by the NDOH in the period 2014 to 31 August 2017. Papua New Guineas 21 public hospitals, 1,993 health centres and 771 aid posts act as the front line of the health crisis. Critically the audit found on average, the health facilities receive approximately only 30% of the stock items they order from Area Medical Stores, and of that amount only approximately 30% of the total volumes or quantity ordered are received. In other words, health facilities receive only 3 out of 10 of the products they order and then only one-third of the quantity they need. That means each hospital, health centre and aid posts is only receiving 9% of the pharmaceutical drugs and medical supplies they need. During the course of the audit, the team picked up a correspondence containing complains constituting an official corruption nature lodged with Health Secretary, Mr. Pascoe Kase against Mr. Paul Dopsie-Executive Manager Corporate Services. The letter dated 07 February 2017 outlining the allegations was sent to Health Secretary and Audit confirmed that it was received by Secretary’s Office on 7th February 2017 and recorded on its 2017 Correspondence Register with ID number 54. The letter was signed and sent by Mr. Harupa Peke, Managing Director of Global Customs & Forwarding Limited (GC&F Ltd) which was one of the logistics companies contracted to distribute 100% Kits in Momase Region a year ago. The letter revealed that Mr. Peke had personally paid cash directly to Mr. Dopsie on several occasions to favourably facilitate the payments for the Company’s claims. Based on the copy of the signed Letter from GC&F Ltd dated 07th February 2017, a total amount of K265,500 was paid between December 2014 and September 2016 to Mr. Dopsie. We also learnt that the Office of Health Secretary has not independently investigated this allegation to confirm its authenticity and provided any appropriate response to GC&F Ltd. The Audit checked with NDoH’s Internal Audit Branch and noted that the allegation has not been referred to their attention. Surprisingly, after we picked up the referred allegation letter from Health Secretary’s Office, we were contacted and advised by Mr. Peke that Mr. Dopsie contacted him on 2nd of October 2017 and on his request they met at Mr. Dopsie’s Office, Aopi Haus, Waigani at 4:30pm. Audit was told that during the meeting, Mr. Dopsie requested Mr. Peke to write another letter to retract the initial letter he wrote containing allegations made against Mr. Dopsie if he wanted to be awarded the NDoH contract which his company bided. Mr. Peke emailed (on 5th October 2017) us the copy of the signed retraction letter together with another letter which was also written by him and presented to Mr. Dopsie stating that if his company was not awarded the contract he would pursue this referred allegation again. Further, we noted through a letter dated 11th October 2017 that was cc’d to Chief Secretary, Health Secretary replied to Mr. Peke on his retraction letter. We contacted Mr. Peke on 26th of October 2017 and was advised that he has not received any letter with regard to the response to retraction letter from Health Secretary yet. Based on above findings, Audit is satisfied that there is sufficient material evidence and available first-hand witness to warrant further investigation into official corruption allegations lodged against Mr. Dopsie. Mr. Dopsie is a Senior Public Servant and occupies an esteemed and influential Position within National Department of Health (NDoH). Any decision or action taken by him would directly affect the provision of vital medical commodities that are procured and distributed to health facilities throughout PNG for the benefit of the citizens. Based on the referred allegation, his actions constitute an intentional misconduct in office for a personal gain and this would have contributed to the medical supplies shortages and other related problems currently faced by the health facilities in the country. The abuse of power qualifies as a serious breach of Public Finance (Management) Act (PFMA) 6. (1) a and b. (2) As Accountable Officer, and the National Public Service, through the Public Services (Management) Act and the Code, require that: (a) An officer shall not obtain or seek to obtain from any person (including another officer or Member of Parliament), any property, benefit or payment over and above the officer’s normal remuneration, or any favour, on account of any action done or not done in fulfilling his or her official duties. Thus, Mr. Dopsie is subject to appropriate disciplinary charges under these and other relevant laws if found guilty. As it is serious in nature, Audit requests that Mr. Paul Dopsie be immediately suspended under Section 52. (1) (2) (a) (b) (i) or (ii) and (3) of Public Services Management Act so that a full investigation will be completed by the Audit in relation to allegation laid against him. If it is correct that no action to suspend, refer or investigate Mr Dopsie has yet been taken by the Minister or Department Secretary, such a delay could legitimately bring into question the reasons behind this reluctance to act and cast a possible shadow over the conduct of Mr Kase and the Minister. The most critical and urgent recommendation made in the audit report is for the procurement function of the NDOH to be outsourced. The audit recommends this be done in two stages, which it refers to as ‘short term gap filling’ and ‘longer term strategic approach’. In the short term, the audit advises the government to seek donor assistance to provide an Inline Procurement Specialist to oversee the day to day procurement functions – whilst implementing the ‘immediate’ key recommendations from the Audit Report. In the long-term the audit recommends the establishment of an ‘outsourced Procurement Centre’ to reduce overall costs and provide independent and transparent procurement specialists. It is unclear whether this is intended to be government run or a private enterprise. In addition the audit report identifies a further 26 recommendations with ‘high priority’ for ‘immediate implementation’ by NDOH.